FAQs > Analytics FAQ > Interpreting KPIs > How do I interpret currency KPIs? Swrve’s Currency Given KPI gives insight into the type and amount of in-app currency that has been given by the app to the user (without generating any revenue for the app). This KPI helps deal with situations where users are granted an initial amount of in-app currency for joining the app, for completing specific tasks in the app or for reaching a certain level. The Currency Purchased KPI gives insight into the type and amount of in-app currency that users are acquiring in your app. Tracking currency with these KPIs provides helpful separation between currency that is actually purchased with real money and that which is given as a motivation or reward in the app. For a general overview of the KPIs available in Swrve, see Intro to KPIs. For more information about creating reports using currency KPIs, see Trend Reports. A currency KPI-based Trend Report provides you with graphs depicting currency purchased and currency given data. The Currency Given and Currency Purchased KPIs are currency-specific. 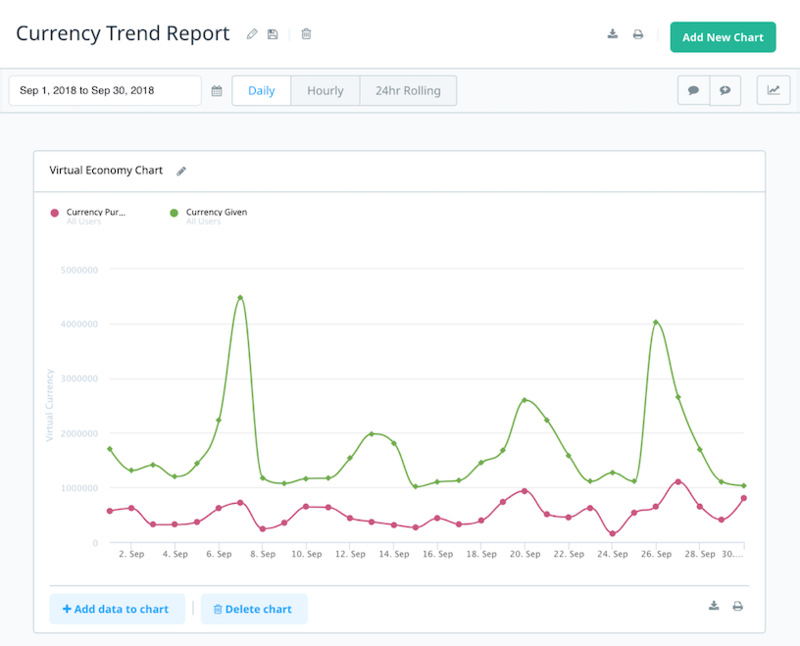 You must select the type of currency you want to track before adding the KPI to the Trend Report and you must add a different KPI for each currency in your app in order to track all known in-app-currencies. The following figure shows the Currency Purchased and Currency Given KPIs on a sample Trend Report.